Precision Tooling Technologies is a complete gage manufacturer and full service shop that was established in 2010 and is located in Zeeland, Michigan. Their objective is to develop great relationships with cost effective services for their customers. Precision Tooling Technologies uses the latest technology to design and build quality equipment that meets and exceeds customer expectations. They are committed to providing valuable services while maintaining a high degree of quality and a personal level of customer service. Their services include check fixtures, custom inspection gages, high-quality details for automated equipment, specialty tooling, design & engineering, prototyping, precision CNC machining, general machining and more. 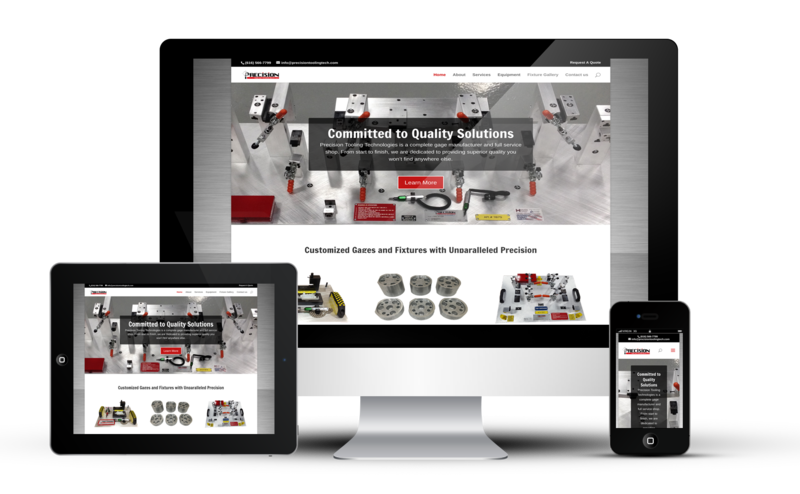 RVWS was able to create a fully responsive, mobile friendly WordPress website for Precision Tooling Technologies that effectively shows all that they have to offer. This company is dedicated to superior quality of service and products, so we wanted to create a website that is also superior in quality and shows their products and services being displayed and used. As part of the development package, the RVWS team went on site to take facility photos and videos as well as assisted in the written content development. The feel of the website is a true representation of Precision Tooling Technologies and offers prospective customers a glimpse inside one of the cleanest shops you will find. Greg Dryer and the entire team at Precision Tooling Technologies are proud of the high quality work they produce and we were thrilled to work with them to showcase their excellent work.